Hello from The bridging Team. It’s well on its way into fall and we’ve all journeyed off on our own paths since the project. From school, to continuing work into the arts, to simply exploring what life has to offer. 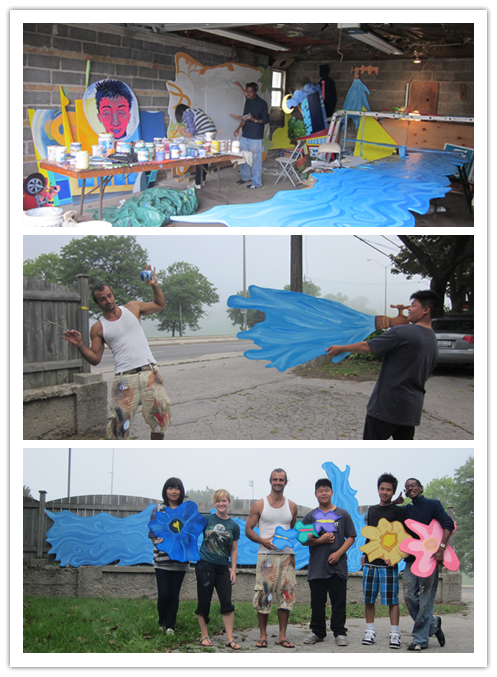 Since our last update we’ve completed the bridge, celebrated arts in the community at the Scarborough Arts Sub-Text festival, and finished the panels for the mural to be installed at Lawrence and Birchmount. Here’s a breakdown. From start to finish, this summer was terribly fun painting with the team. We cracked jokes, and had a little too much fun cooling each other off with spritzer bottle to keep our spirits burning brighter than the sun to finish the job ahead of us. Many of the wonderful community members shared good wishes and compliments as they found something new to enjoy each time they crossed the bridge. Lots of friends and volunteers came in for the last day to help us cover the span of the bridge with the bright red colourful decorations and text. It was a great project and we were happy to have left a smiling mark on the community. The very next day we finished the bridge, the team and Lawrence community moved right into the Sub-Text festival under the bridge. 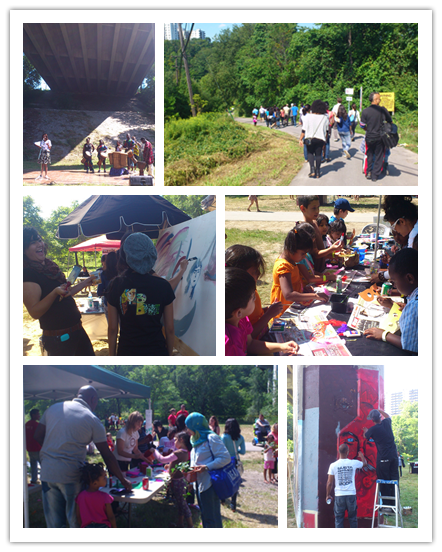 Artists, performers, speakers, graffiti artists, and workshop curators came from all over to celebrate. Tons of people came out both days to check out the festivities and art. This was the second run for the sub-text festival and it seems like it’s only gonna be more and more fun each year. The final challenge for the team was finishing the 40+ panels being installed for the birchmount and Lawrence plaza. It took a few extra weeks for Rob and a few dedicated members from the team to complete the task. It seemed like panels were falling from the sky at one point. But it all came together in the end and will soon be up and ready for viewing sometime this month. Thanks for checking up and we hope everyone is having a good time with themselves. 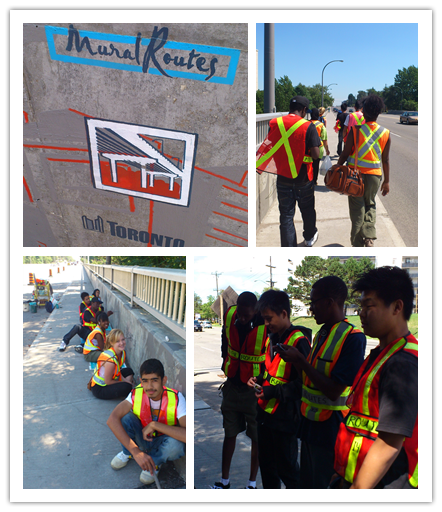 Like “Mural Routes” page on Facebook to follow our latest updates.